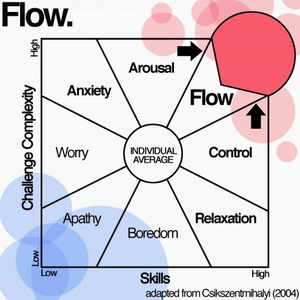 flow: complexity & skill. You grow into flow by mastering challenges, or in the words of the big guru on flow: Mihaly Csikszentmihalyi a single-minded immersion in performing and learning. You need a combination of progressive complexity and skill to reach the ‘flow-state-of-mind’. In fact flow is already there when the challenges we encounter match our ability. In this situation you experience a state of control or relaxation. If you stay in this comfort zone you will fall out of flow. You have to challenge yourself and pick a more difficult task to get back into flow. The concept of flow is closely related to motivation, its components being: activation, persistence and intensity. A subject well researched – and much looked-after by organizations who long for engaged employees. It is the core of gamification that uses playful interaction to persuade users to become superusers. In essence gamification creates a learning curve and a ranking structure by providing small steps to reach a goal. Motivational techniques are intrinsic: supporting mastery (complexity & skill) and extrinsic: joyful recognition (feedback & status). 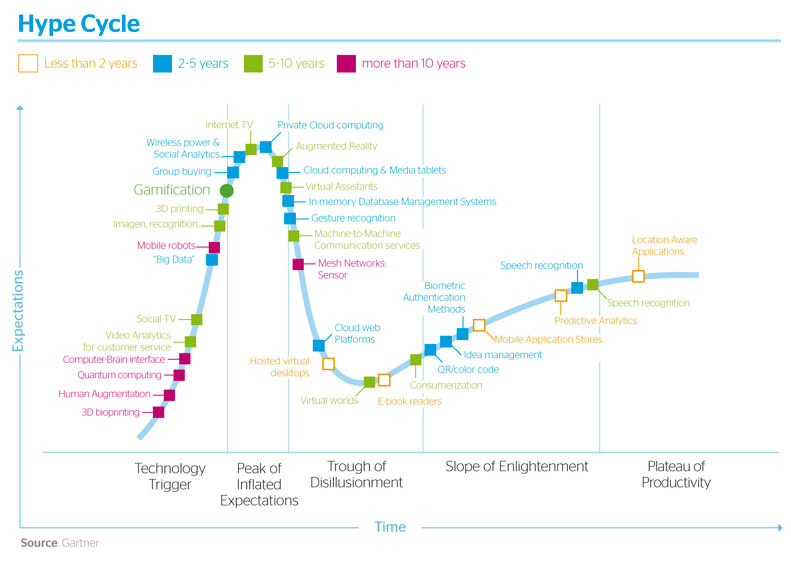 If you compare the hype cycle of gamification with big data its not surprising to spot the connection of the emerging technologies that support their useful application. Both thrive on the professionalization of data-information. Having the data is not enough, you need to gather, interpret and use the data. In the words of Mike Wu : “raw data are not suitable for human consumption“. It would be too easy to merge technology innovation with business innovation. If you put gamification and big data together you and up with a dashboard. It is a hype much scrutinized because it not always puts the focus – what you want to innovate – at the center. Dashboards have the potency to lure people with surface-design of nice metrics and markers. But beautiful graphs don’t equal meaningful insights: “by visualizing data people can view things differently – in new, more innovative ways. It can help data-democracy – we depend on each other’s data and walls between departments should be crumbling. You can create dashboards that sync perfectly – and beautifully – between desktop and tablet.” Think of your dashboard as a keyhole view into your data. If the keyhole is large enough to show you the full picture, then the data visualizations that are reflected will also show you the full picture. If the keyhole is small, as only a fraction of your data can be taken into account at a time, then the data visualizations may paint a pretty picture, but are entirely meaningless if you are trying to grasp a new insight. The CIO-blog perpetually points out that innovating is a lot like trying to build a campfire. Wild gusts of wind will blow out the initial flames. On the flipside, if a fire doesn’t have room to breathe, it’ll die. Properly stacking the wood is essential. Freedom and structure are equally important to the success of innovation, striking the right balance between the two requires incredible discipline. To match the emerging technology pipeline with specific business goals is work and not following the pack down the latest rabbit hole. It is not about the tool, nor the technology. They both can enable goals, but it is the insight in how you can reach that goal that sparks true magic. Metadata about data. HBR and others show that there is exponential data growth especially on the part of unstructured data. AIIM found that 70 percent of company information is unstructured. And recommends (not surprisingly) to hire information professionals. Data growth comes in V’s: Not only: Volume, Variety, Velocity but also: Viscosity, Virality and Value. 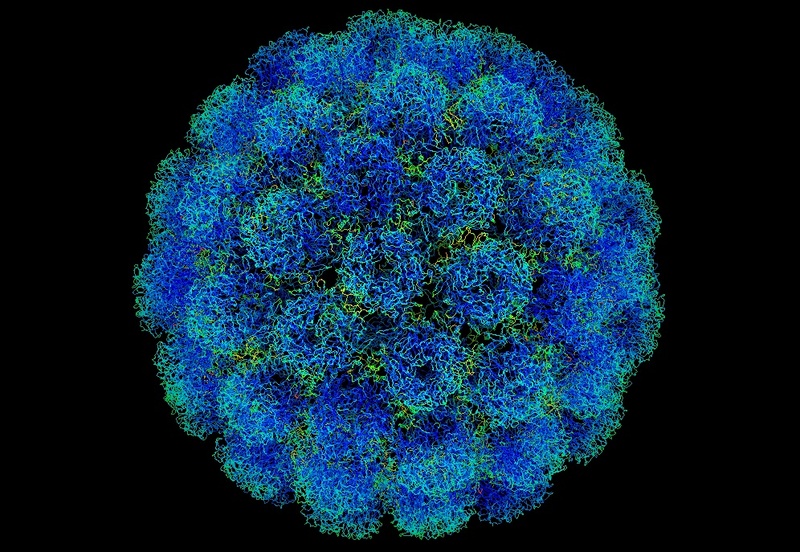 These last three are about the resistance to flow in the volume of big data, the spread between unique nodes and the adde value – the contribution to insight. With ECM systems (enterprise content management) you can manage your content and applications and turn static into dynamic content delivery. 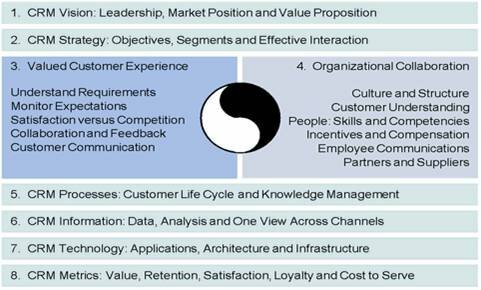 Creating new ways of working collaboration and social capabilities will be embedded across the application portfolio to support the system of relationship. This all sounds too beautiful to be true. And it indeed is if we take Clay Christensen‘s lesson serious. He points out that we aggregate things in order to understand the world with our limited minds. And that it is our choice of measure that defines success. Back to the data then, there are three types of analysis: Descriptive (event counters) condense big data into smaller more useful nuggets of information. Predictive: scores or labels what happens based on studying recent and historical data. In short it forecasts what might happen in the future. (f.i. sentiment-analysis, the input is plain text, the output a sentiment score, the sentiment-label predicts wether it is a positive or negative sentiment). Prescriptive: recommends what needs to happen. It predicts possible consequences based on different choice of action and recommends the best course of action for a pre-specified outcome. You need a predictive model and actionable data and feedback system to track the outcome produced by actions. Data can make us smarter and/or more efficient. It can support us to understand what certain merged datasets accomplish us to strive for. But strategic planning does not also produces novel strategies. Instead, it perpetuates the status quo. 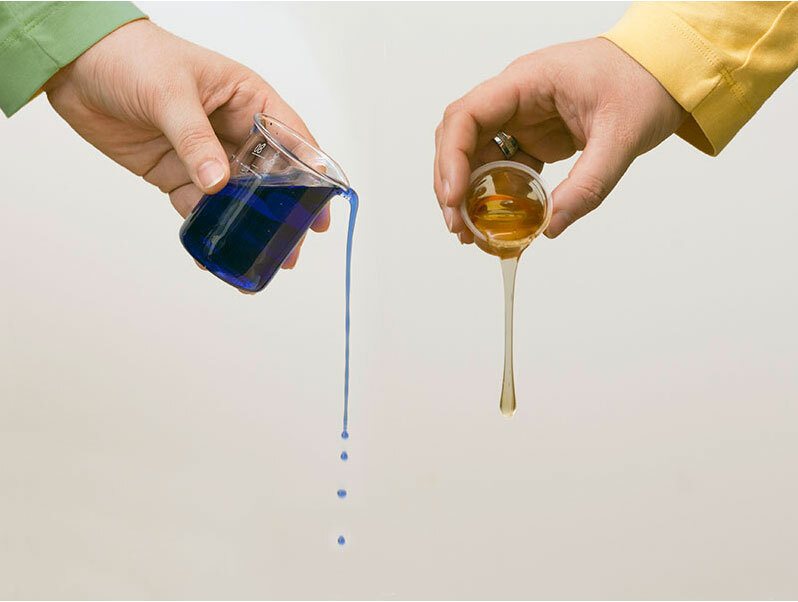 Integral to scientific methods are the creation of novel hypotheses and the generation of tests of these hypotheses – two elements that conventional strategic planning typically lacks. according to Roger Martin in HBR. Big Data brings along the use of prescriptive analysis for the analysis. 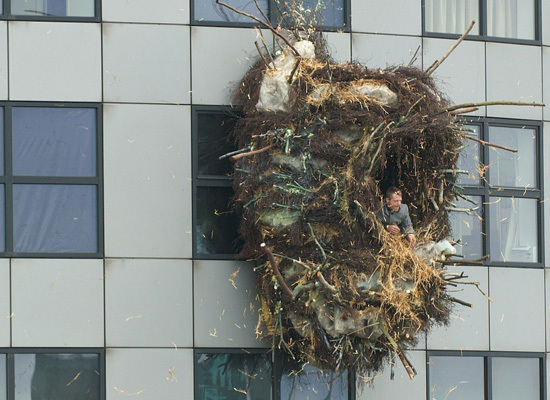 A bit like watching the watchers. It might help us to see our Galilean paradox – view of perspective on patterns. But it should not make us prisoners of the system. Although we can accumulate and merge much more data then before, it will not make us superusers. We need to be able to understand the connection between our skill or behavior (use of data) with the score, otherwise we will not be motivated or worse unleash a disengaged flow. If we really want to challenge ourselves we might dig deeper in the complex field of data-analysis. We have always known that the representation of data chooses a frame to look at reality. 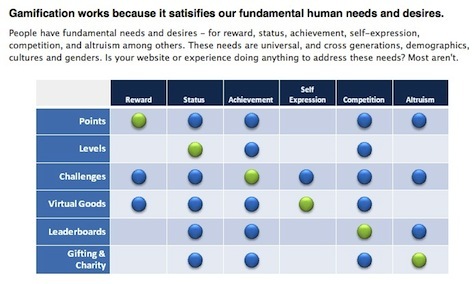 Gamification and Behavioral Science use these frames to influence our choices and motivate us to keep on track. Behavior is the result of beliefs and value systems. Can we nudge these cultural components with the help of the right measures? Or will we create a Kowloon walled city – an ecosystem that is so complex that if you get lost you better stay inside? A cradle of which you never know what will happen if you take away one sliver. Do not build one layer over the other but take the time to really understand what metrics matter. And do build room for experiments (emerging patterns) and progressive insight (the perspective to see acceleration – not motion) to alter the data and type of analysis for success. Enable superusers who can exploit the data to improve themselves, not users trapped by the system to perform according to the rigor (mortis) of statistics.